Purchase CD here – Buy now! *Please note that the One Sheet is in the PDF format and requires the latest version of the Adobe Acrobat Reader. You can download it for free at the Official Adobe Reader web page. Heart Strings is my official debut CD! It is a collection of twelve musical compositions for stringed instruments and small group ensembles that weaves together the romantic and gentle melodies of multiple stringed instruments creating a soothing and unique sound. These lush arrangements make for a pleasing ambiance. 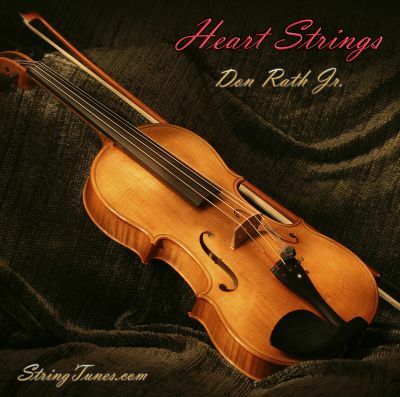 After a long day at work, Heart Strings offers a quiet and romantic musical experience. Truly, music to soothe your soul! Read what others are saying in various parts of the world about the music of composer Don Rath Jr. Awards – One title on Heart Strings has placed well in the 2007 UK International Songwriting Contest and it was my first award, Hey There! and two additional titles placed well in the 2008 UK International contest amongst 6,000 entries in the instrumental category. They are Sonata in C Major and Trail of Tears! No other CD can ever be called your debut album with the exception of your first. Heart Strings is my first official CD release and hopefully it is one of many more to come. Here’s a tidbit of information for you – the process of making a CD especially one where is was produced mostly over the Internet is the subject of my article; Resources for Making and Selling a CD using the Internet. I hope you enjoy Heart Strings. I also hope you like it well enough to suggest it to your friends. That would be cool! Please feel free to check out my other CD’s too! Dawn of a New Day – The CD and Colors of Cello – The CD.